steven in france: Hey Rouje… ne ple-ures pas! *2008 is the year of entry of this class, X is the thing you prepend to represent Polytechnique. Why X? Because one of the emblems of Polytechnique involves two swords criss-crossed in a X form. Plus P doesn’t sound as cool. Alexandre, portuguese friend, helping me move out! On Wednesday, I played in a concert as part of SymphoniX. SymphoniX is the student orchestra completely run by students (so OCO, without Diana, plus alternating student conductor). Gabriel, the conductor, and I… Au revoir, Gabriel! We got an audience of about 150 people! I guess that shouldn’t be surprising given the size of the school. I’ve also been part of a quintet all semester long. We played Dvorak’s piano quintet, 2nd movement (Dumka). Our (almost) weekly rehearsals were at first hard for me as I didn’t understand all the French music terminology (for example, they use solfege instead of letters for notes). Towards the end though, I started to get the hang of it and it was quite enjoyable. (L to R). Alexandra, Laurent, your’s truly, Aurore (piano), and Pierre. See you guys! I’m going to miss our late night rehearsals! 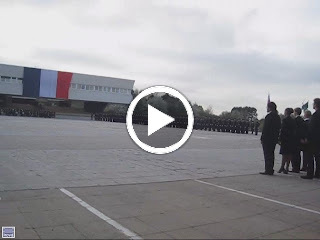 The official ceremony of the week happened on Friday, when the minister of defense of France arrived to lead the “passing of the flag”, symbolizing the transition from X2008 (the students who are leaving now; I’m a part of this group) to X2009. The ceremony was rather official, involved horses carrying laterns, and concluded with the singing of the song of X2008. Afterwards, there was a grand show, called “Amphi Départ”. This was a 4-hour long show basically trying to compress X2008’s last 2 years here into a few hours of sketches, songs, and videos. I was astonished by the amount of organization and preparation that went into it. First the spectacle took place in two concurrent lecture halls/theatres. Scenes and people would transition between the two theaters seamlessly with video. It was quite ridiculous, funny (when I could understand the puns), and touching! Hey Rouje, ne pleures pas. *Rouje, an intentional mispelling of the French word for red, Rouge, is the nickname of the 3rd year promotion. X2009 is called Jaune (yellow). Rouge et jaune are two colors of X.